Decoded: The Winning Formula Of CharaExpo 2017! 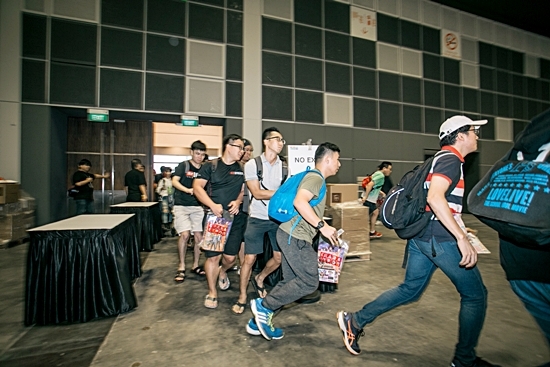 While many people are looking forward to this weekend's 2017 Formula 1 Singapore Airlines Singapore Grand Prix, let's relook at CharaExpo 2017 that happened the weekend before and recollect the many fond memories from those exciting and dynamic Japanese entertainment content that still linger amongst us. 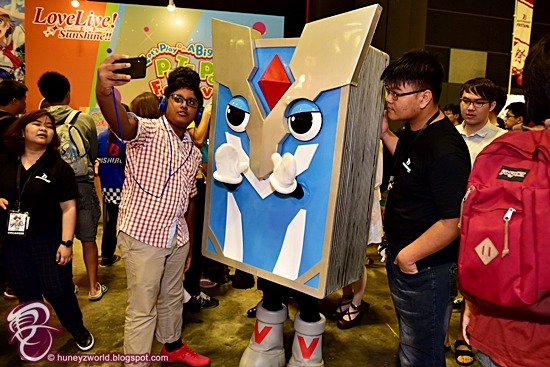 Despite it being only the third year running, the success of past two events has already established CharaExpo as one of the key annual events among Anime fans, Japanese TCG players and Cosplayers both in Singapore and around the region. Mad rush at the opening of CharaExpo 2017. Credit: CharaExpo 2017. Here are the five (5) success factors that I felt have contributed to CharaExpo's attraction to draw an ever increasing visitorship - a new record of a total of 19,247 visitors - throughout last weekend on 9th and 10th September 2017 at Suntec Singapore Convention & Exhibition Centre, Hall 404 - 406. 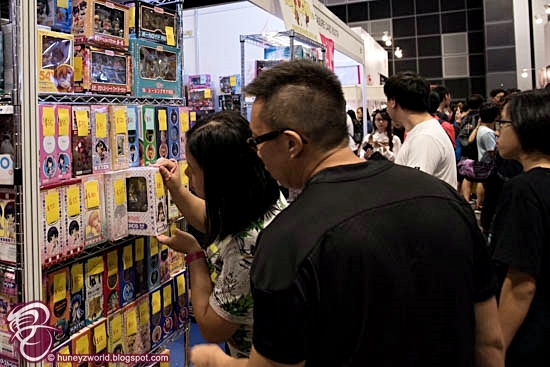 The annual CharaExpo event is a great one-stop place to get your favourite authentic and exclusive merchandise ranging from collectable toys, OST, appeals, bags to prints as the organizer (Bushiroad) is the producer of Japanese collectable and trading card games (TCG) and owns media franchise of many popular Anime series such as Love Live!, BanG Dream!, and Tantei Opera Milky Holmes. 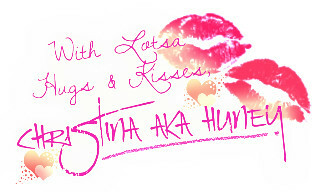 While there are many uncommon and rare merchandise (e.g. Remilia Scarlet Nendoroid action figure!) 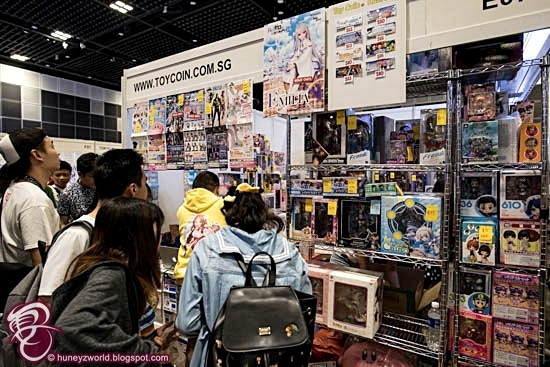 on sales and on discount from the likes of Good Smile Company, Toy Coin, and Otaku Tachi, the real deal for Anime fans was the opportunity to grab those exclusive Bushiroad merchandise, such as Love Live! Sunshine!! Aqours Jersey featuring member’s representative colors, including WGP 2017 merchandise for the first time outside Japan! 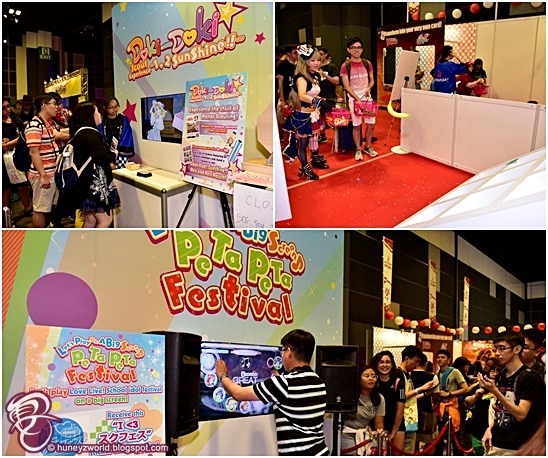 In conjunction with Bushiroad's 10th anniversary this year, Bushiroad showcased its flagship titles with slew of fun activities for Anime fans to dive into such as playing games for FREE by simply present the CharaExpo 2017 ticket to at the game booths and win prizes! 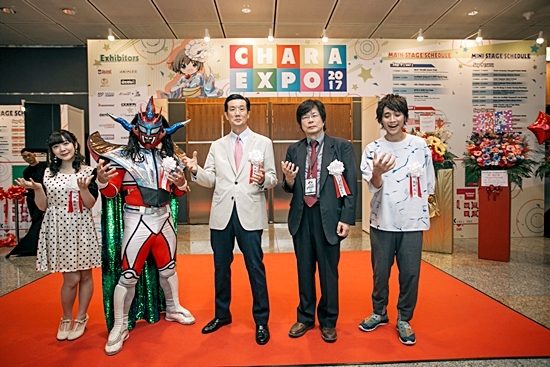 CharaExpo is a mini themed Comic Con, where fans have the opportunity to meet up with their idols such as celebrity Cosplayers, Seiyuus, TCG artistes and even MMA star! Cosplay luminaries, Ely (Taiwan), Hakken (Malaysia), Knitemaya (Australia), and Yui (Hong Kong) were here to judge for this year’s Cos Stage competition as well as scheduled autography and photo-taking sessions to the delight of their adoring fans. 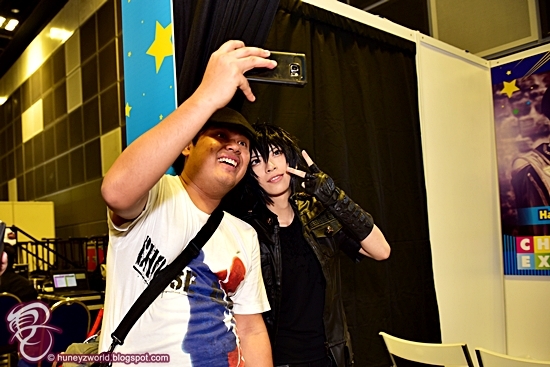 Selfie with Cosplayer YUI from Hong Kong during photo-taking session at CharaExpo 2017. The debut appearance of KEMONO FRIENDS on the back of their recent Anime television series in Japan created much excitement among Anime fans and their joint performance with the returning fan favourites Poppin’ Party, the all-girl band from popular anime series BanG Dream!, and Tomohiro Hatano had rocked the final CharaExpo ENDING LIVE STAGE! and ended the event on a high! bring stars and fans together under one roof. 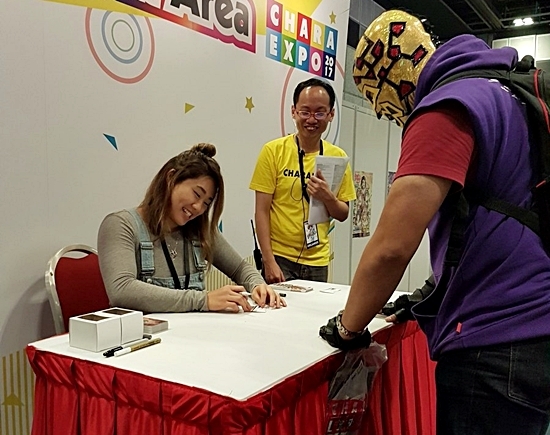 Fortunately, fans of pro-wrestling were not left out in cold despite the absence of a New Japan Pro-Wrestling stage this year as they got to meet and had an autograph session with New Japan Pro-Wrestling’s stars Jushin Thunder Liger and Tiger Mask. Being able to attend and understand the thought process was an golden opportunity for Anime fans and that's priceless. And that was what they got with Aso-PA Manga & Anime Drawing Workshop and Akira Ito: Cardfight Vanguard!! 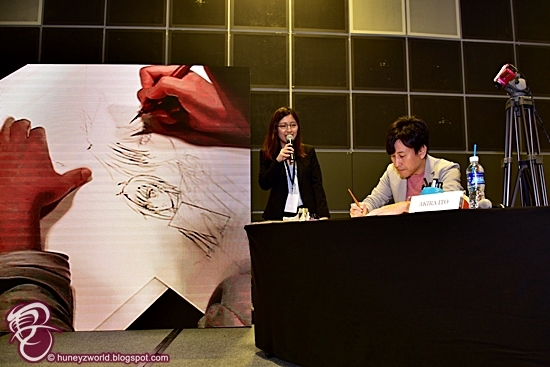 Live Drawing at Mini Stage during the event! Cosplayers also got their rare opportunity to learn the tips and tricks from one of the region's very best at Ely's Cosplay Make-up Workshop. While Live stage performance was much scaled down then previous editions, performance on both ENDING LIVE STAGE! 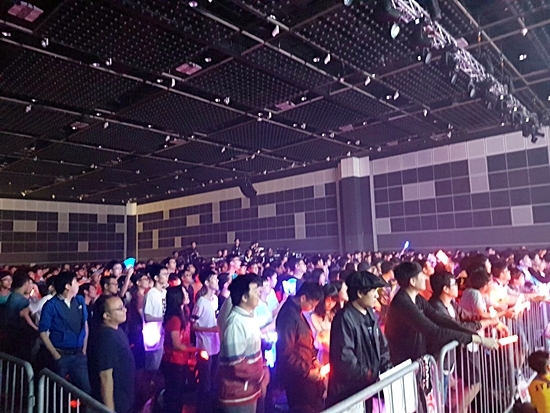 at CharaExpo 2017 featuring Featuring Rummy Labyrinth, Rita, Milky Holmes on Day 1, and KEMONO FRIENDS, Tomohiro Hatano, Poppin'Party on Day 2, did bring out the light sticks that waved in unison to the tempo! 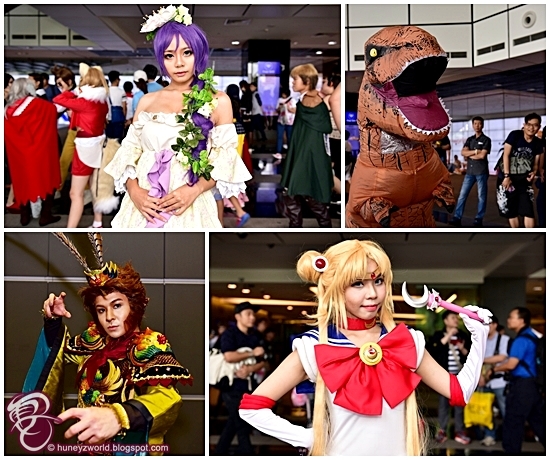 Cosplaying has been a significant part of Japan due to its Manga and Anime culture and event that featured Japanese Entertainment Content would certainly incorporate such activity. With such emphasis, CharaExpo has became an annual gathering place in Cosplayers' calendar to dress up as their favorite characters in Manga, Anime or PC/Video gaming as well as an opportunity for photographers to test their skills in capturing the best moment of these costume players in their elaborate best. 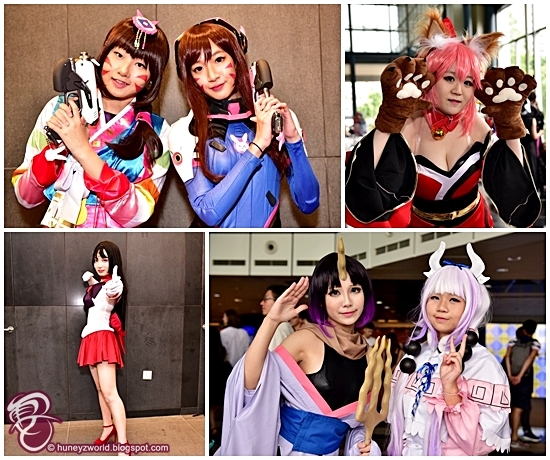 While it was common to see cosplayers dressed up as popular gaming characters of Overwatch, Miss Kobayashi's Dragon Maid, Love Live! and the evergreen Sailor Moon, I do notice a growing trend for inflatable costume such as T Rex and Big hero 6 characters. 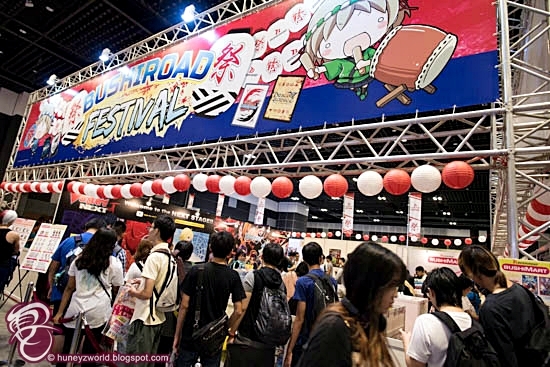 TCG has always been a big component of CharaExpo since day 1, thanks to its organizer Bushiroad, the leading producer of collectable and trading card games. 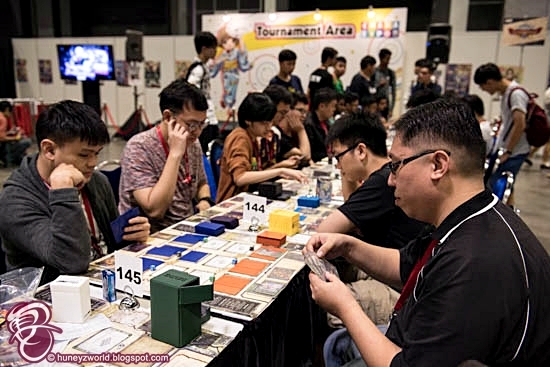 To hold a Regional Qualifiers (WGP 2017 and BCS 2017) and side tournaments at such a venue has certainly helped to bring in crowds from both competitive and leisure TCG landscape as well as TCG traders, while at the same time generate the awareness for non-players (and hopefully conversion), who otherwise would unlikely to walk into the many small TCG outlets littered around Singapore. and Future Card Buddyfight -will receive a paid invitation to pit their skills with the strongest opponents, in the World Finals taking place in Tokyo, Japan early next year! 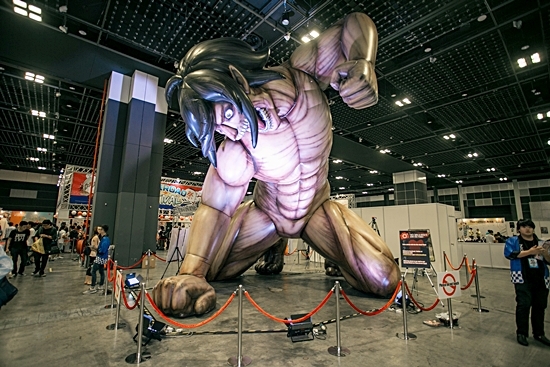 The life-sized Eren Titan presented event goers a photo opportunity as a souvenir to bring home from CharaExpo 2017. 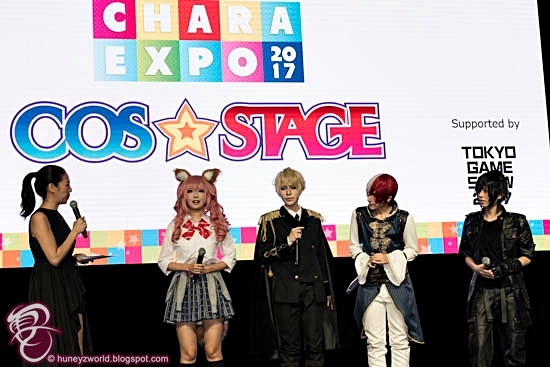 With the five (5) success factors in play, CharaExpo 2017 has managed to achieve a record high visitorship despite having a smaller venue and has scheduled the event two months later than expected (previous events were held in July), which incidentally fall within the End-of-Year examination preparation period for many students and also went head-on with another competing event happening in the same weekend, within the same vicinity! With the success, I am looking forward to a bigger and better live stage performance from CharaExpo in 2018! Wait! That's Dessert by Cake Avenue?! Are You Ready For STGCC 2017?